Our optometrist provides a 40 minute lifestyle eye examination, catered to suit your specific needs. The computerised chart includes real size car number plates, television menus, pictures and many more programs to address visual problems that we all have in the real world. You can also expect all of the procedures in the boxes below to give your eyes the complete check. The worlds leading OCT scanner produces images of the inside of your eye which are similar to an MRI. The scan goes beyond what we can see in a regular eye exam and gives detailed images down to cell level. 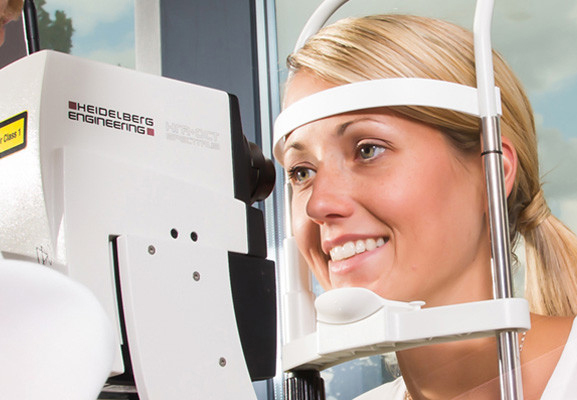 The scans help detect and manage Macula degeneration, Glaucoma and any retinal abnormality. The images are truly amazing. Often referred to as the Glaucoma check, the IOP (the pressure of the fluid inside the eye) check provides invaluable information about what is happening inside the eye and what is happening to the surrounding structures – like the brain. This test provides information about the nerve fibre pathway between the eye and the brain. Certain systemic disorders can lead to nerve fibre damage so this examination provides invaluable information. Have you ever had a problem with images overlapping, or losing track of what you are reading? Do words on a page run in to each other? Do you get headaches when you are using the computer or driving? You may have a fixation disparity. This part of the eye examination assesses how your eyes work together. Eye exercises or special lenses can help to alleviate these symptoms. This test examines the functionality of both eyes and whether they are working together. Ever wonder why you don’t enjoy a 3D film the same way as everybody else? Ever stood in front of a picture and wondered why all your friends can see the hidden image and you can’t? You may have reduced or no binocular vision. If you’re concerned, mention this to our optician in your test. The eye has three retinal pigment cells which allow us to see in colour. Males have a higher probability of having a colour vision defect. Approximately 8% of males have a congenital colour vision defect. An acquired colour vision defect can sometimes mean that there is a medical problem. If you are concerned, mention this to our optician in your test. Ready to book your eye test? That’s great news, you obviously have impeccable taste!